Where do you read your eBooks? Have you tried Kindle? Some books really hit you, yanno? Just knock your feet out from under you and leave you stunned, in a good way. Standing Sideways does that. Takes you on an emotional whirlwind into the deepest pits of grief and despair, then slowly builds you back up, stronger and more sure of yourself than before. After loosing her twin brother in a horrible tragedy, Livia Stone is trying to return to life as she knows it back in her small town in California as a senior in high-school. She should be applying for colleges, flirting with boys, gossiping with her best friend Cao, and working on her writing but Livia is utterly apathetic. She hasn't written a word since her brothers death, her grades are slipping, her relationship with her mother is strained and her father non existent. She has even started over-medicating with the pills from the psychiatrist. When Daniel moves into town, Livias stagnant existence is shaken. For the first time in what feels like forever, Livia feels again. But feeling again also hurts, and hurting is something she really just can't deal with right now. It could be that I read this book only a couple weeks after the Parkland shooting in Florida; still raw and hurting from yet another mass shooting that took family, friends, innocents too soon. 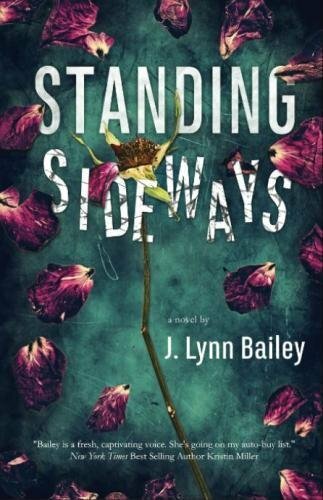 Or the fact that Bailey is just a stellar writer (yes, that she is for sure), but I really found this book so heartbreakingly moving. Livia's grief and despair just permeates through the pages, you want so badly to hold and comfort her (although it probably wouldn't help). It shows the ugly side of grief, how tragedies like Parkland or Newton leave such an immensely devastating wound for the community in it's wake. Grief is hard. It's messy. It hurts us. It makes us hurt. Livia desperately clings to anything that can numb her from those painful feelings. She looks for it in the bed of her best guy friend, in a handful of pills, and the bottom of a bottle. She self medicates her pain to the point where it almost kills her. I thought the relationship with Livia and Daniel was really beautifully written, and appropriate given each of their personal situations. Cao was the best friend everyone should have in their corner; the comic relief when you think the world has gone insane. Absolutely brilliant book! Poignant and heartbreaking, with rays of hope to light the way to the end. Can't recommend this one enough! Just as an FYI- ALL proceeds of this book will be donated to the Jason Dale Triumphant Return Scholarship at College of the Redwoods which I think is an absolutely incredible gesture on behalf of the author. You can order your copy from Amazon here. Work while you travel: How to pay your bills and travel the world. Hard Rock Hotel and Casino, Punta Cana (DR) - a stay review. The Blue Lagoon - Guidelines for a relaxing visit. Disney Do's and Don'ts: Things to keep in mind. New York City: Sleep No More will blow your mind. Copyright © CoCo & Mia and ReadExploreRepeat, 2019. All rights reserved. Unauthorized use and/or duplication of this material without express and written permission from this site’s authors and/or owners is strictly prohibited. Excerpts and links may be used, provided that full and clear credit is given to CoCo & Mia and ReadExploreRepeat with appropriate and specific direction to the original content. All images are property of ReadExploreRepeat.com and its collaborators. ReadExploreRepeat Logo, and Paper Airplane symbol are property of ReadExploreRepeat and may not be used without consent. Images of book covers utilized on our book reviews are used for reference purposes only. It should be noted that any questions regarding the copyrights to the cover art of such books should be addressed with the book publisher/authors. AFFILIATE DISCLAIMER: ReadExploreRepeat is a participant in the Amazon Services LLC Associates Program, and Google Ads - affiliate advertising programs designed to provide a means for us to earn fees by linking to Amazon.com and affiliated sites.